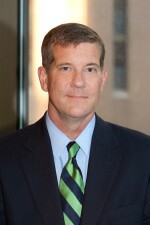 Eric Rosenkoetter is based in the firm’s Austin office. For many years, he has focused his practice on various aspects of financial services law. Eric has substantial litigation experience, in a wide variety of cases. As a litigation attorney, he has conducted every aspect of the litigation process, including countless depositions, motion proceedings, bench and jury trials, and appeals in various courts. In addition, Eric also has significant experience as a compliance and transactional attorney, providing strategic, business growth, legislative, compliance and regulatory advice to national corporations and trade associations. For example, he has drafted consumer contracts and disclosures designed to state-specific statutory requirements, and developed “Best Practices” guides and state-by-state compliance grids, for national financial services companies. He also conducted research and crafted a metrics report for a national trade association with analysis designed to counter the claims of advocacy groups. Eric’s experience also includes working for a national corporation as Executive Counsel, Chief Compliance and Ethics Officer, and Director of Legislative Affairs, and as a federal lobbyist and Director of Government and Public Affairs for a national financial services trade association. In the government sector, Eric presided over approximately 6,000 state administrative hearings, served as a staff attorney for the Missouri Senate, and handled litigation in 33 counties as a regional managing attorney. » Introduction to the CFPB, NARCA Attorney Workshop, 2013. Eric earned his Juris Doctor from Washington University School of Law, and his Bachelor of Business Administration from Southern Methodist University. He is a member of the American Bar Association, the American Bankers Association, the national Mortgage Bankers Association, RMA International and ACA International. He is admitted to practice law in Texas and Missouri and in the U.S. District Courts for the Eastern, Western, Northern and Southern Districts of Texas.